1/4 Set against triangle and 2. 2 & 3 are defended in man to man. 1 passes to 4 or 5, in this case to 4. 5 cuts to ball side low post. 4 passes to 1 for a shot. If 1 isn't open, 4 dribbles towards the center of the floor. 1 & 5 cut towards the basket. 2 & 3 screen down on the triangle. 2 & 3 will now occupy 2 defensive players. 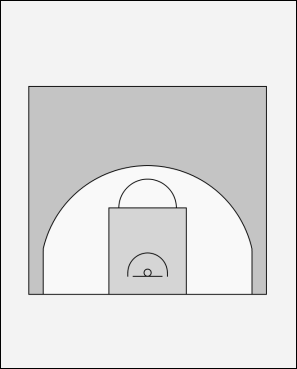 1 & 5 use the screens set by 2 & 3. 1 & 5 can even cross under the bucket to create more movement. 4 passes to 1 or 5.